A Snowy Owl has been recorded in North Clare, just the fourth such sighting of the bird in Clare during the past 100 years. The bird was sighted on Sunday in the Gleninagh Mountain area, located a few miles northwest of Ballyvaughan along the North Clare coastline. 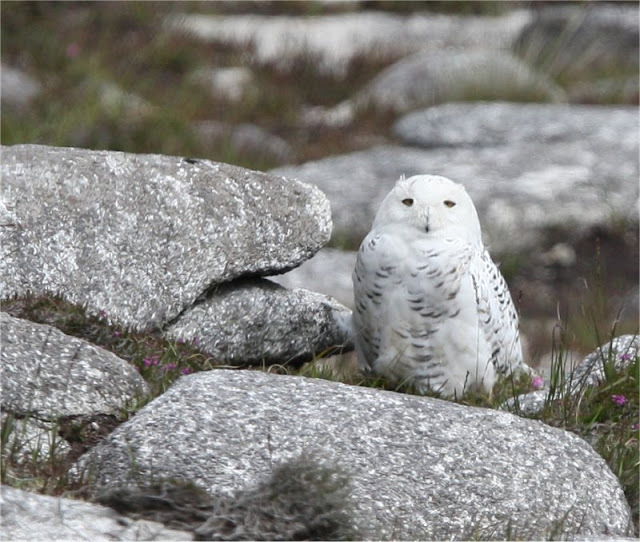 A Snowy Owl was recorded in the same area in late May 2014. Previous sightings occurred in Mount Callan in 2010 and at Maghera in East Clare in 1907. The European population of Snowy Owls is currently evaluated as ‘Rare’ due to its small breeding population of less than 10,000 pairs. It is a rare winter visitor to Ireland, mainly in the northwest of the country. The bird does not breed in Ireland with the majority of the European population breeding in Scandinavia and Russia. Below pics by John Murphy.